Retrieve the Amulets of Night Power. Retrieve both of the Amulets of Night Power. Talk to Feran Sadri in Volkihar Keep and he will tell you of two amulets which will augment your powers as a Vampire Lord. He will direct you to two random locations, one containing the Amulet of Bats and the other containing the Amulet of The Gargoyle. The amulet may be in possession of a boss or in the chest at the end of a dungeon. Head to the two dungeons shown on your map, retrieve the amulets, and return to Feran, who will give you several potions of blood as a reward. It appears that two additional amulets, the Amulet of Draining Grip and the Amulet of Drain Magicka, may have been planned for this quest, but were later abandoned. 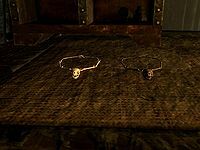 Since the quest may choose a random corpse to place an amulet, it's sometimes possible for the corpse to have already vanished, leaving you stuck with a quest marker pointing to an empty location on the floor. ? 10 Feran Sadri has sent me to retrieve the Amulets of Night Power. 255 Finishes quest I have retrieved the Amulets of Night Power. The following empty quest stages were omitted from the table: 110, 120, 130. On the PC, it is possible to use the console to advance through the quest by entering setstage DLC1RV09 stage, where stage is the number of the stage you wish to complete. It is not possible to un-complete (i.e. go back) quest stages, but it is possible to clear all stages of the quest using resetquest DLC1RV09. This page was last modified on 28 December 2018, at 16:44.